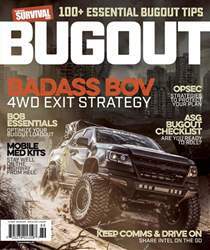 Digital Subscriptions > American Survival Guide > Bug Out 2018 > WHY BUG OUT? A similar question for survivalists is, “Why would you bug out from a perfectly good home?” After all, for most of us at least, home is where the bulk of our supplies resides. We know the area, and we can at least recognize our neighbors on sight, even if we don’t know them well. Why in the world would we leave the familiar to venture into the unknown? Bugging out is one of the most popular topics in the survival world—and, in many ways, perhaps among the least understood as well. If nothing else, there is certainly a lot of difference of opinion as to what “bugging out” is or isn’t. Simply put, “bugging out” is evacuating your home or wherever it is you are located and moving to a presumably safer location. It might be that your house has become damaged in the disaster and is no longer habitable. Perhaps civil unrest is increasing in your town and the crowds are growing ever closer to your residence. Whatever the reason, you’ve determined that discretion is the better part of valor and you’re going to exit stage right.